Review: At first glance this may appear to be yet another found footage movie that is low on concept and high in shaky camera footage. Well, color me surprised. What we have here is a movie not only high on concept but one that finds ways around the standard hand shot technique and develops into quite a ride. The ingenious creative team uses multimedia and our new milennium connected-ness to tell it tale of three ordinary guys that suddenly find themselves quite extraordinary. It takes the fantastical elements from Heroes and blends them with the dark look at high school that was hiding behind Carrie’s horror façade. Focusing on three seniors (one popular, one not, and one stuck in the middle) who have a chance encounter with something otherworldly while at a rave in the middle of nowhere, the first half of the movie is standard but entertaining “look what I can do now!” moments that showcase above average special effects with a stronger narrative than the film has any right to have. As is the case with most movies with people gaining superpowers, everything starts out fine but as the boys grow in power their darker sides are revealed. For a micro-budgeted movie this has the sheen of a movie under the eye of an A-List director. Newcomer Trank proves himself one to watch as he guides the film into finely finessed sequences of unexpected tension. He’s aided by a strong trio of leads. 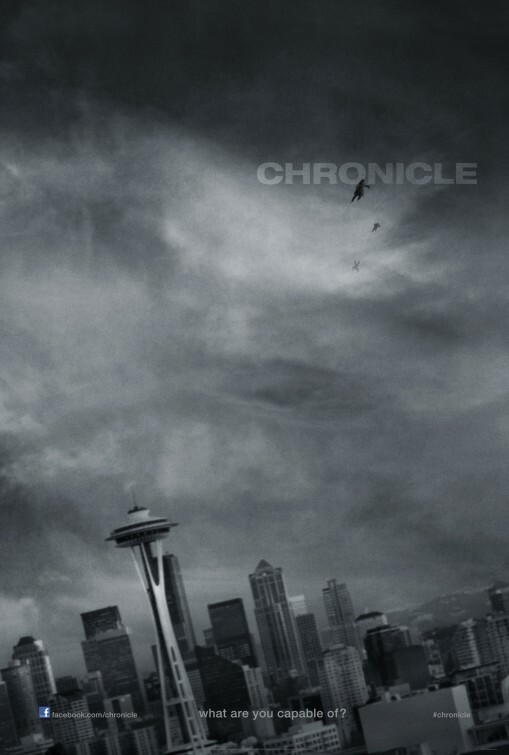 DeHaan (a dead ringer for Leo DiCaprio circa 1992) is at the center of Chronicle as the put upon and put down unpopular kid that originally buys the camera used for the film to ward off his alcoholic father and capture his dying mother’s final days. Bringing the camera to school we see him bullied by guys and ignored by girls. In these introductory scenes we get a total picture of his life and a look inside the high school hierarchy that we all lived through and would like to forget. His cousin (Russell) is a protector of sorts for him and by the time they wind up with Jordan (as a senior class president in the making) to investigate a strange hole in the ground, we’ve gotten a good idea where all of these people sit on the totem pole. In found footage movies there usually isn’t a lot of explanation or elements of backstory and that trend mostly continues here. Where the film falters a bit is when it tangents off in an attempt to give some character development. It’s not an unwelcome effort, but the sharp contrast these lighter scenes have against some of the more intense segments can be jarring. For those who get queasy at these types of shaky cam footage flicks you can keep your nausea pills at bay. I won’t reveal too much of why or how this is so but just know that things calm down enough to ease your motion sickness. There is a definite build up as the movie goes on…leading up to a finale that’s quite rewarding and unexpected. It’s pretty amazing, actually, that the movie builds itself higher and higher in a Jenga-esque tower of instability without ever toppling over. I’m interested to see how this holds up on repeated viewings but on first viewing I found this to be a real winner. Give it a shot…it’s a lot more mature than the previews make it out to be. Nice review! But I disagree, I thought the plot seemed incredibly weak and really died without a proper backstory. It so so full of angst and melodrama it made me want to grow out bangs and dye them black, just so I could use them to cover my eyes. Check out my review and let me know what you think!